"I don't feel safe even inside my house," said Gary Joseph as he put various mattresses for himself and his two sons to sleep on under a tree outside the house in Port-de-Paix. See photos. PORT-DE-PAIX, Haiti (AP) — The death toll from a 5.9 earthquake that hit Haiti over the weekend rose to 15 people with 333 injured, authorities said Monday, as thousands of people slept outdoors fearing aftershocks would topple their cracked homes. Haiti’s civil protection agency said it will soon deploy 70 soldiers to the Nord-Ouest and Artibonite provinces that were hardest hit, noting it already sent 14 soldiers along with nurses and doctors to the area. Thousands of people along Haiti’s north coast dragged mattresses and chairs outside after a strong 5.2 magnitude aftershock on Sunday rattled cinderblock homes already cracked by Saturday’s earthquake. Sunday’s aftershock caused panic on streets where emergency teams were providing relief to victims. The U.S. Geological Survey said the epicenter of the aftershock was located 9.8 miles (15.8 kilometers) north-northwest of Port-de-Paix, which is about 136 miles (219 kilometers) from the capital of Port-au-Prince. On Monday, Haiti’s Ministry of Communication released figures stating that at least 15 people had died, nine in Port-de-Paix, one in Saint-Louis du Nord and 5 in Gros Morne. Among the dead were a 5-year-old boy crushed by his collapsing house. 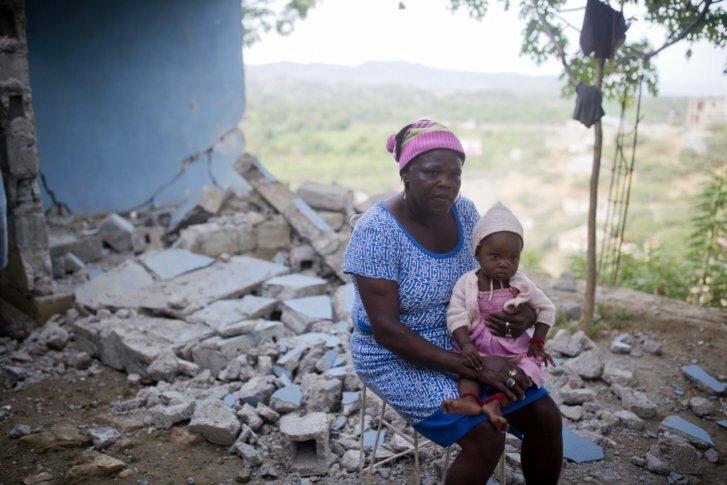 Etanvie Dimorne, a 50-year-old mason, said people have to rebuild stronger given the earthquakes that have hit Haiti. He lost his home in Saturday’s quake and is now sleeping under a tarp in someone’s yard.